Water bus stop ‘Ferrovia’ next to the Santa Lucia train station. The small white boats are private taxi’s. 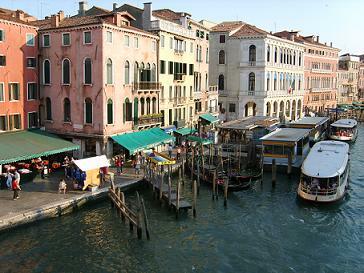 The most popular water bus in Venice is Line 1. 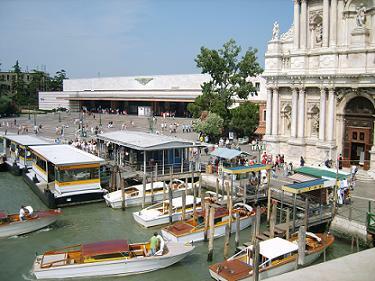 The route starts from bus station ‘Piazzale Roma’ along Santa Lucia train station and St. Mark Square to Lido island. Piazzale Roma (bus station/taxi), Ferrovia (Santa Lucia train station), Riva de Biasio, S.Marcuola, S.Stae, Ca d’Oro, Rialto Mercato, Rialto, S.Silvestro, S.Angelo, S.Toma, Ca Rezzonico, Accademia, Giglio, Salute, San Marco (St. Mark Square), S.Zaccaria, Arsenale, Giardini, S.Elena and Lido. Between 7.01 in the morning and 20.21 in the evening, water bus Line 1 departs every 10 minutes. In the early morning and late evening, the boat departs 3 times/hour. From Piazzale Roma to St. Mark Square takes 40 minutes. To the Lido takes allmost 1 hour (59 minutes) If your hotel is not in the historic centre then your travel time can be quite long every day.